If you have a family and would like the ability to relax by the pool with some privacy from the kids playing nearby, a cabana fits the bill. And if you like to entertain with a pool parties, your guests will appreciate the cozy space that a cabana provides for quiet conversation. A beautiful pavilion is a superb method to expand your outdoor living space. As major construction is required to build one, it is best to include these permanent additions as part of a total backyard makeover with a new pool, deck, and landscaping. However, if your swimming pool and backyard space is already built and you’re looking for a simple, affordable way to get a slice of resort-style living at home, then a prefabricated cabana is an excellent choice. Prefabricated cabanas (or gazebos) are typically built with a frame and columns made of sturdy materials like wood, dense plastics, or powder-coated metals. The frame and columns feature support rods and other fittings from which to enclose the cabana with a tented covering or from which to hang curtains. Cabana “roofs” can be flat, gabled, or peaked. They are either constructed of a solid material or consist of a soft material draped and fitted into the frame of the cabana’s ceiling. Models come in various styles to accommodate most any desired look and feel. What makes many of these prefab configurations so convenient is that they can be installed, moved, or taken down with relative ease. More elaborate setups may require a construction professional, but usually only for less than a day of labor. How much does a pool cabana cost? Like so many purchases, you get what you pay for. The trick is to know what you want in a pre-fab cabana and how much you’re willing to invest. Then, you search for a ready-to-assemble design that suits your specifications and that won’t break the bank. You can spend around $250 for a simple pergola-type cabana or about $500 for an entry-level gazebo-style model. For several thousand dollars, you can purchase a more upscale model available in numerous color choices. Even more luxurious models are available by investing north of $10,000. Features like furniture and other décor and accessories—such as mounts for a flat-screen TV or a ceiling fan—will run more. So that you know what to look for when shopping for a cabana, let’s look at the key features that make them stylish and comfortable. A mainstay attraction of cabanas are their curtains or tent-style canopies that create soft-walled enclosures. Some units come with structured covers that are designed to keep at least three of four sides covered up most of the time; only one side is well-suited to be routinely opened and closed for exit, entry, and added privacy. For home use, you probably don’t need the level of seclusion that you might want at a busy hotel pool. In your own backyard retreat, curtains are probably the best choice. Typically, cabana structures allow you to tie curtains to the columns and to easily pull them closed. Fabric styles run the gamut, and you should consider several factors in selecting the one to best meet your needs. For a relaxed, resort-like atmosphere, you may want to be surrounded by soft curtains billowing in the breeze. If so, choose a fabric that’s sheer and transparent—but know in advance that they will keep out nothing except the mosquitos. Others curtains are lightweight and semitransparent, but they offer enough density to diffuse some of sunlight to create a lightly shaded, private ambiance. For greater privacy and protection from the heat, wind, ultraviolet rays, and outside pool noise from the kids, go for a heavier, opaque curtains. With thicker material, you will enjoy a greater sense of shelter from the weather and from any loud conversations, running, or splashing that may be going on around you. Consider curtains that are UV-resistant and that are durable enough to stand up to a range of weather conditions. Keep in mind that some cabanas offer hardware that makes it easy to switch out curtains; this flexibility means you can change fabric for different occasions, like a pool party or a romantic evening for two. With cabana curtains, consider how the color you pick will impact the visual appeal and mood of your outdoor space. Some models offer a myriad of color options. Consider what will fit best in your backyard: Which choices will complement the colors in features like your deck, patio furniture, swimming pool tile, and landscaping? Or, which one will add a much-needed vibrant pop to an otherwise, neutral palette or understated outdoor space? No cabana is truly complete without some kind of seating or lounge furniture. After all, the cabana is experience is about relaxation. Your cabana should make you feel like you’re at a far-away resort each time you use it. With indulgent, stress-free loafing as your goal, a pair of nicely cushioned chaise lounges is among the top seating options for your cabana. You want something cushier than a typical patio lounge chair. Here is a great example of a set with sofa-like appeal that’s made for outdoors. 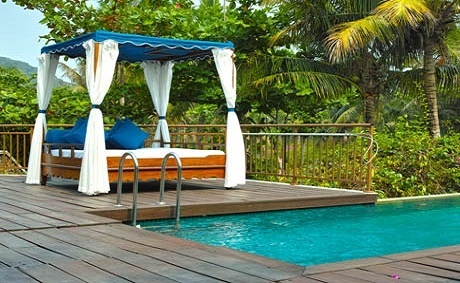 For the ultimate cabana experience, go for a daybed. That’s right, a bed where you can decadently unwind or even snooze in the middle of the day. It’s a guilty, but affordable pleasure. Some even come with a cabana as part of the unit—everything you need is a single integrated piece. Here is one example of a generously sized daybed with a built-in canopy for under $1500. For a more structured, higher-end version with a full cabana, see some great examples here. Without costly, hassle-filled travel to another destination, you can escape right outside your back door. A tent-style or curtained cabana is an affordable way to bring a little panache to any backyard, and it can be outfitted to provide extra flair and function for sun-splashed living. Along with seating or lounging accommodations, consider other ways to enhance functionality. A small table or mini shelf provides a convenient spot for a magazine, cool beverage, or music device. Now, all you need is some sunscreen, a chilled drink, and a good book. Now this is luxury.